A team of scientists on board the H.M.S. Challenger first discovered the existence of a large rise in the sea floor in 1872 when they were looking for suitable undersea locations to set down telegraph cables. Later in 1925, soundings of the sea floor were taken to get a picture of the topography of the sea bed in these locations. They were astonished to discover that there were not only mountains on the sea floor, but there were mountain ranges longer than any mountains on land. 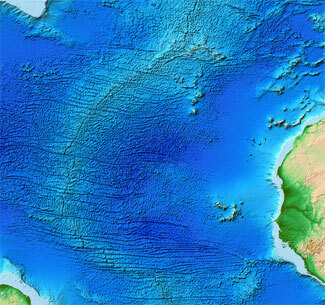 After years of mapping the sea floor, it was revealed that the longest, unbroken mountain chain in the world was running through the middle of the Atlantic ocean. They called it the 'Mid-Atlantic Ridge' and determined that it was over 40,000 kilometers long! What surprised them even more was the discovery of active volcanoes along the entire length of the Mid-Atlantic Ridge. Scientists were at a loss to explain such extensive undersea vulcanism. At that point in time, no one believed it was possible for volcanic eruptions to occur under the immense pressure and depth of the sea bed. Yet there was lava oozing out from the cracks in the sea floor without sending any hints of its occurence to the surface of the ocean. All this had been happening silently, out of sight, under the sea for who knows how long. Geologists collected samples of lava rock from the sea bed surrounding these areas of volcanic activity, carefully recording the location and began piecing together the puzzle of these undersea lava flows. Scientists used the magnetic anomalies recorded in the lava rocks to date them - to tell how old they were and when they formed. Using this technique they discovered that the newest, youngest rocks were at the very center of the ridges and the oldest rocks were furthest away. That told them that the undersea volcanoes were the site of formation of new ocean floor and that the oceanic crust was being pulled apart along these rifts, or tears, in the ocean's crust. These were determined to be spreading boundaries of tectonic plates. A spreading boundary is where the tectonic plates are separating, or coming apart. Some spreading boundaries are places where the crust is sinking downward as it is stretched thin - like in the East Rift Valley of Africa, where the Dead Sea is located. Many of the spreading boundaries are located deep in the ocean on the sea floor. These are places where volcanic activity is at a premium because the crust is being torn apart. New crust is forming when magma from the mantle deep down is forced upward out of the cracks where the plates are coming apart. Long chains of undersea mounts (like the mid-Atlantic Ridge) and volcanic islands (like Iceland) typically characterize these type of plate margins.